Ahead of an official announcement, the US defence secretary says Afghanistan is too unstable to lose a major presence. US DEFENCE SECRETARY Robert Gates appealed for patience with an unpopular war – and said that only modest reductions in the number of American troops would make sense this summer in a still unstable Afghanistan. On his 12th and final visit to Afghanistan as Pentagon chief, Gates held out the possibility of a turning point in the war by year’s end. But Gates, who’s retiring at the end of this month, said much depends on whether the death of al-Qaeda leader Osama bin Laden creates a new opening for peace negotiations with leaders of the Taliban insurgency. This and other aspects of the war, now in its 10th year, were on the agenda for Gates’ meetings Saturday with General David Petraeus, the top US and NATO commander there, and with US ambassador Karl Eikenberry. A decision on US troop reductions is expected in the next couple of weeks. Gates stressed the effectiveness of US-led NATO military operations against the Taliban over the past year, after President Barack Obama ordered an extra 30,000 US troops into Afghanistan. Gains have been notable in the south, the heartland of the Taliban movement. “I believe that if we can hold on to the territory that has been recaptured from the Taliban … and perhaps expand that security, that we will be in position toward the end of this year to perhaps have a successful opening to reconciliation” with the Taliban — “or at least be in a position where we can say we’ve turned the corner here in Afghanistan,” Gates said. In Kabul, Gates also spoke at a news conference with President Hamid Karzai, who repeatedly stressed his anger at civilian deaths caused by airstrikes. The president also criticised night raids and detentions of innocent people. 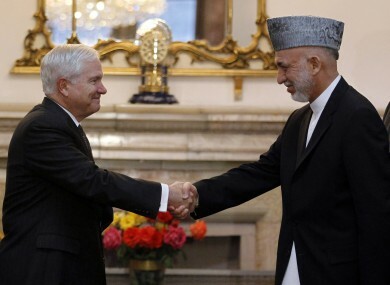 “We cannot take this anymore,” Karzai said, making no mention of civilian deaths attributed to Taliban fighters. Gates offered conciliatory words about unintended civilian deaths and injuries. Email “US withdrawal from Afghanistan will only be "modest" - Gates”. Feedback on “US withdrawal from Afghanistan will only be "modest" - Gates”.